Shouldn’t teams in hazmat suits descend on Wilson and shut down his operations before someone gets hurt? On the contrary, there are people in the government who think that Wilson is key to keeping this country safe. When the U.S. Department of Homeland Security heard about Wilson two years ago, officials invited him to their offices to hear more about his research and determine whether or not it could be applied toward their counter-terrorism efforts. Because Wilson was only 15, they weren’t expecting much, but Wilson came prepared. After shaking everyone’s hands, he announced, “You know your building’s radio-active, right?” The pager-sized Geiger counter attached to Wilson’s belt was beeping, an indication that the granite surrounding them contained unusually high amounts of uranium—not enough to be harmful, but enough for Wilson to raise a few eyebrows. Wilson got his start on Fusor.net, a website where nuclear hobbyists who call themselves “fusioneers” fill message boards on topics that would enthrall only the geekiest subset of society, like “So where can I get a deal on deuterium gas?” The goal of every fusioneer is to build a reactor that can fuse atoms together, a feat first achieved by scientists in 1934. Ever since, nuclear fusion has been hailed as a potential “clean” energy source, although scientists have yet to figure out how to harness its power. By the time Wilson stumbled across Fusor.net, 30 hobbyists worldwide had managed to produce the reaction; Wilson was determined to become the thirty-first. He started amassing the necessary components, such as a high-voltage power supply (used to run neon signs), a reaction chamber where fusion takes place (typically a hollow stainless steel sphere, like a flagpole ornament), and a vacuum pump to remove air particles from the chamber (often necessary for testing space equipment). To expand his collection, Wilson dragged his dad, Kenneth, on long road trips into the New Mexico desert to go prospecting for uranium ore; they returned with boxfuls. Meanwhile, Wilson’s growing obsession with all things radioactive “worried me a whole lot, ” admits Kenneth, who turned to pharmacists and professors he knew around town to ask if what his son was doing was safe. “After they talked to Taylor, they’d tell me not to worry so much, because they said Taylor understands what he’s doing, ” Kenneth says. He and his wife, Tiffany, tried to tell themselves that Wilson’s “nuclear phase” would pass, just like his previous obsessions. At age 3, he asked for a hard hat and orange cones and then directed traffic on his street. At age 7, he’d memorized every rocket made by the U.S. and Soviet governments from the 1930s onward. But of all of Wilson’s obsessions, radioactivity stuck. Hoping that the right guidance could keep their son from doing damage to himself or others, the Wilsons moved from Texarkana, Ark., to Reno and enrolled Wilson in the Davidson Academy of Nevada, a public school that caters to gifted kids. (Wilson’s IQ tested in the 99.99 percentile.) His physics teacher, George Ochs, encouraged Wilson to enter the local science fair, but did a double take when he heard that Wilson had his heart set on building a nuclear reactor in his garage. “I said, ‘Whoa, wait a minute. You’re going to irradiate your parents, and maybe the whole neighborhood, ’” recalls Ochs. “I suggested he build it somewhere safe, like a university." After months of researching, building, and welding, Wilson put the parts of his nuclear reactor together, using the basic blueprints posted on Fusor.net. He added his own personal touches. It looked like a cappuccino maker on human growth hormones. To find out if it worked, Wilson filled its reaction chamber with deuterium gas, retreated behind the lead wall, and then flipped the switch to the reactor’s high-voltage supply. 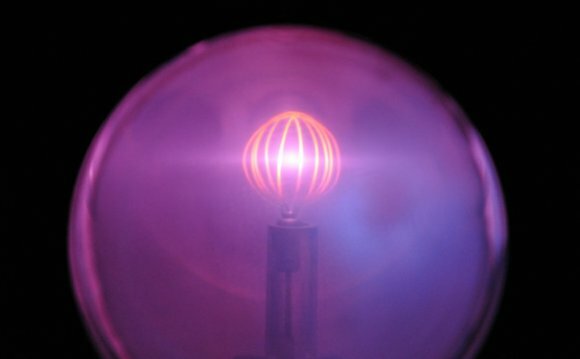 Tens of thousands of volts of current coursed through a golf ball–sized wire grid within the reaction chamber. If all went well, this would fuse the atoms of deuterium together and release radiation—not nearly as much as fission (or the splitting of atoms) produces, but enough to cause radiation poisoning or other health complications if things went to hell. Wilson picked up a tiny glass tube called a bubble dosimeter that he’d placed near his reactor. If he saw bubbles, the subatomic particles that make up radiation had penetrated the tube, heating the hypersensitive liquid inside. Squinting at the tube, Wilson spotted five bubbles.